NaNo May Be Over, But I’m Not Done! NaNoWriMo was amazing! I’ve taken the past couple days to sit back and relax after my final push to the end, but the novel draft is not complete. I’m using Final Deadline to help me reach the end goal: a complete first draft. I know that if I stop now, Sincerely Yours, Lucy will never be completed. Because it is the holiday season, and I neglected both my husband and my children (hey, they are 15 and 17–they can look after themselves..mostly), I decided to keep my weekends free so that I can spend some time with them–not that the teens care all that much. This may look like a grueling scheduling, but if NaNo has taught me anything–it is that I CAN write at least 6,000 words in a day if I must! Writing less than 2500 in a day–easy peasy! I plan to keep you updated on progress made toward the completion of the draft this month. I will also be giving a review of Scrivener and Final Deadline. For those of you still finishing your NaNo draft–Happy writing!And for those who are working on other great projects–Cheers to you and Happy Writing! There were days when I wanted to give up, but I pressed on through the worst cold ever, writer’s block, and a break for the holiday. Today I wrote 6,640 words and completed the NaNoWriMo 50K Challenge! I’ll Drink to that!! Prost! I still have a little more work to do before the first draft is done, but I am 50,134 words in and 30 days ago, I had zero. I feel like this challenge has motivated to me actually get this novel finished in December and I am ready to re-write and edit this baby in January and February. I never thought that I could actually get so far in writing a novel. I have started so many of them, then lost motivation and drive. Thanks to all of the NaNo writers who encouraged me as we traveled this journey together. And Congratulations to those who have or are about to complete the challenge. After taking Thursday off for Thanksgiving and Friday off for the Nuremberg Christkindlesmarkt opening ceremony, I was a little over 9,000 words away from the finish line. This is a not-so-great picture of the Christkindlesmarkt opening ceremony. Many glass of Glühwein were consumed as well a nice Hot Toddy from the lovely Scottish Sister City, Glasgow. Needless to say, we all stumbled our way back to the train station and woke up quite late the next day. Saturday was supposed to be my power writing day, but I was too tired. So, I managed to get in 2,537 words before going to bed at ten o’clock. Today, Sunday November 29th, was a great day! I intended to get in about 4,000 words and leave the rest for Monday, but the closer I got to 50,000, the more inspired and energized I became. By the time I hit 48K, I was determined t o finish the challenge. 6,640 words in total today, and a whopping 50,134 words in total! I may be a nut, but I printed out my winners certificate and plan to frame that bad boy and hang it on my wall to encourage me to keep going. Has anyone else done this, or do I just like to toot my horn? For those of you who are still typing away and about to burn the midnight oil, I salute you! Happy writing! I finally hit 40K on Tuesday! However, I fell short on my word count today. I had a ton of prep and cleaning to do for Thanksgiving (We’re hosting a large party of 10 guests), so I only managed 927 words. By the time I sat down to at least get in the remaining 740, I just couldn’t think. I won’t be writing on Thanksgiving or the day after (we’re going to the Nurnberg Christkindlesmarkt on Friday), so that leaves me with the final 9,057 words to write between Saturday and Monday. I know I can do it! I’m too close now to give up. Hope you all have a fabulous Thanksgiving! Gobble Gobble and Happy Writing! With only nine days to go and another 13,168 words left to write, I realized just how far I have yet to go on this novel. I will make my winning word count by November 30th, but I don’t think I will have completed the entire draft of the novel. After trying to figure out what scene to write next, I decided to try the Cork board feature of Scrivener. I arranged all of my scenes into chapters, and thanks to Scrivener, I realize how much I have yet to write! Chapters that are complete have been marked with First Draft, and the ones marked To Do have not yet been started. Some of the chapters marked started are nearly complete, while others contain only a few hundred words. This feature of Scrivener has really helped me visualize where I need to go, and how to get there, however, I am a little disappointed to find out that my novel is not even half way finished even though I have written over 36,000 words. It looks like I will still be doing a lot of writing in December. Thanks to NaNoWriMo, I know that I can finish it, and this push to win has taught me that I really am capable of getting more than a few hundred words down in one session of writing. Now I just need to discipline myself to focus at least 5 days a week on writing. Next year I will begin the rewrite and edit phase of this novel and will hopefully have a manuscript to publish by next November. Fingers and toes crossed! But for now, I just need to get this baby written! I made the target word count for the day, but aside from that, I didn’t get ahead. I did however spend some time organize all of my scenes in Scrivener to help me get to where I need to go next. Since my scenes were written out of order, I was having trouble figuring out where I was in the novel. Now that everything is organized, I think the last 13,168 words will be a lot easier to write. Here are my stats for Day 22. My numbers are not very impressive, but at least I am not trailing behind. Here’s a snapshot of my Scrivener Cork Board. It took me a few hours to organize, mostly because I am new to the program. Now I have a much better idea of what I need to write each session. This could help improve my daily word count. I hope the rest of you who are participating are doing well. We’ve got eight days to go, and then we can all take a breather. Happy Writing! Hello everyone. Just wanted to leave a quick update on my sluggish progress toward winning NaNo. We are just slight past the halfway mark, with only 10 days to go! I was doing really really well, and then bam! Nothing. I could not write. I felt like quitting. I slammed into that brick wall, and none of my usual tricks worked to pull me out off a writing slump. But, I finally just forced my self to write one sentence about Lucy might feel if she were unable to perform her job. Before I knew, it, I was actually writing. I kept on writing until I had run out of energy. I probably need to set a timer to remind me to eat. I guess one can’t survive on coffee alone. So now I’m back on track. I’m not ahead, but at least I’m dragging 5 thousand words behind today. Now it’s time to buckle down and get ahead so that I can enjoy Thanksgiving with family and friends. Under your desk. In a public bathroom stall. On a horse. If you’ve “noveled” someplace you probably shouldn’t have, give yourself this badge. I’m sure there are plenty of you who have noveled in peculiar places. So far I’ve written while taking a bath, walking the dogs (using my Samsung Galaxy Note), and at my kid’s high school while waiting for a parent-teacher conference. While these are most certainly not the strangest places to work on a novel, they are not entirely normal–or are they? Have you noveled in strange places? 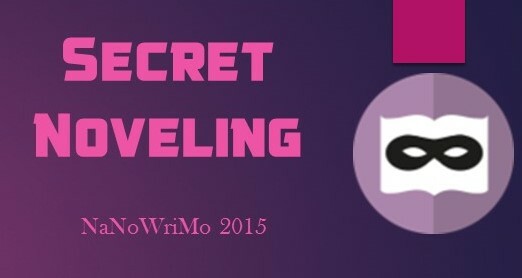 Have you been noveling in secret? I’d love to hear about it! Wherever you write, I hope you are having fun! katesolveigsong on I Did It!